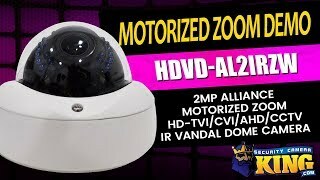 This motorized 2MP/1080p Vandal Proof dome from our Alliance collection of security products was made to be the difference between you being able to identify a criminal or not. You can easily connect this to a DVR using four different technologies like HD-CVI, HD-TVI, AHD and Analog. 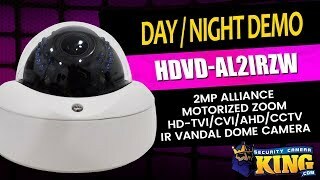 This HD security camera delivers 1080p resolution over coaxial cable using HD-CVI, HD-TVI and AHD while Analog gives you a beautiful 960H resolution. If you purchased a complete package at one of those “Big Box” stores a few years ago, there’s a very good chance that you’re in need of an update and the quality products we offer at very competitive prices should be your first choice when setting up a new security system. With a 2MP CMOS sensor, you’ll have great quality video that will help you have better image color and quality. Add to that the versatility of the motorized 2.8mm-12mm zoom lens and you’ll have a great all around camera. The motorized zoom lens makes life so much easier when you need to change a view. Don’t worry about dragging a ladder out to make the change. Your zoom can be adjusted from your desk, in front of a television and anywhere else that you can access the OSD (On Screen Display) and that includes your favorite IOS or Android smart phone. Throw in a little night vision with the built-in IR (infrared) and you’ll be able to see in low light and pitch black as far as 113 feet away. It’s super easy to connect using coaxial cable and a 12v power supply and you can connect different technology cameras depending on your requirements. That’s a great opportunity to test different types of cameras and see which works best over time. At that point, you can easily choose the best camera for your situation and swap them out as your requirements might change. Don’t forget to make sure that your cable is not chewed up or worn out since you can easily order cable at the same time and potentially save a headache going forward. This and all of our Alliance cameras come with a 1 year warranty, FREE US based tech support and there are no additional costs for remote viewing software!